Base of Operations: Unknown, presumably the U.S.A.
Powers/Abilities: Immune to fire. Able to turn invisible, though he must recharge this (and his personal energy) periodically using a "power giving" device in his lab. 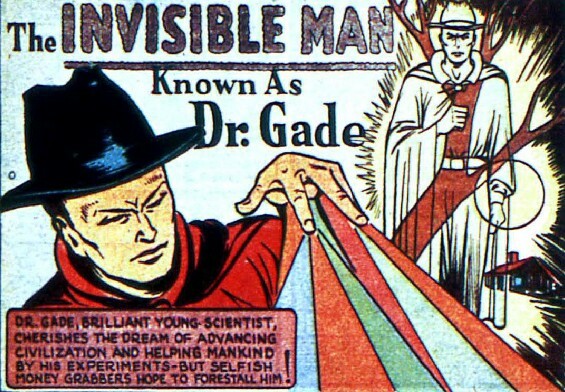 History: (Mystic Comics #2, ga) Dr.Gade was a brilliant young scientist whose advances worried certain vested interest parties so much that they sent an assassin to kill him. The would-be assassin tried to kill Gade by throwing him into a blast furnace, unaware that the chemicals Gade had been working with had rendered him uninflammable. Gade emerged unharmed from the fire, only to discover the entire process had somehow turned him invisible. Gade swiftly figured out how to reverse the process using a device he put together in his lab and attached to his belt. Now able to turn invisible and visible whenever he pleased, Gade figured out who had sent the assassin. Discovering his attacker in the same office as the money men who had sent them, Gade takes a final revenge on them all. (Mystic Comics #3, ga) Dr.Gade took on a group of grave robbers led by Deadpan Louie. (Mystic Comics #4, ga) Dr.Gade tracked down Fatty, a man who had murdered an actress. Comments: Gade proved to be quite a murderous hero in his brief career, killing virtually every opponent he faced.